Along with pizza, hot dogs, and apple pie, hamburgers rank as one of Americans’ favorite foods. From quick-service restaurants to diners, and bars to cookouts, the hamburger is a staple on almost any menu. Why is it such a beloved food? Because the hamburger is customizable, portable, and versatile, finding itself as a gourmet item or a quick to-go meal. It’s pretty clear that hamburgers aren’t going anywhere. But what isn’t so clear is how the hamburger got its start. Let’s examine the origins of the simple, yet extraordinary burger. While there are many claims to the hamburger throne, there is no true hamburger king or queen. However, despite the lack of written history, there are a number of contenders. Louis’ Lunch in New Haven, Connecticut claims to have invented the hamburger back in 1900 when a customer hurriedly asked for a quick meal he could take on the run. Charlie Nagreen sandwiched a meatball between two slices of bread in 1885, creating what was known as a “Hamburger Charlie.” Frank and Charles Menches supposedly invented the hamburger in 1885 in Hamburg, New York, when the brothers ran out of the sausages they were selling and were forced to use ground beef. In 1904, it was said that the hamburger gained popularity at the World’s Fair in St. Louis, where it was sold by Fletcher Davis, a fry cook. In 1916, Walter Anderson, another fry cook, invented the hamburger bun, creating what resembles the hamburger we know today. Anderson became the co-founder of White Castle. Today, hamburgers are practically works of art for chefs. Like art, there are no rules to how we create our hamburger concoctions, from the patty to the bun, and especially the toppings. The right ground beef composition of a hamburger patty can make or break the sandwich. The standards set by many chefs suggest an 80% / 20% lean-to-fat ratio, especially for burgers cooked medium-rare to medium. This keeps the burger from both drying out and becoming too greasy with the right amount of fat. A high-fat composition works for more well-done burgers, as it prevents the patty from drying out and losing flavor. We aren’t exaggerating when we call the hamburger the most customizable sandwich. Hamburger patties can live between any type of bun – from sesame seed and potato to ciabatta and pretzel rolls. Outside of the traditional cheese, lettuce, tomato, onions, and pickles, hamburger toppings have taken the stage for restaurants to showcase their unique burger creations. Fried eggs, pulled pork, blue cheese, roasted peppers, and even macaroni and cheese all find themselves atop of hamburgers these days. As for condiments, it’s just as experimental – from ketchup and mustard to sriracha and barbecue sauce. French fries are the perfect companion to any burger, no matter your preferred style of fry. But along with fries, onion rings and tater tots also rank high on the hamburger sidekick scale. But let’s not forget the other quality sides that pair well with burgers, including salad, corn on the cob, coleslaw, potato salad, and pasta salad. 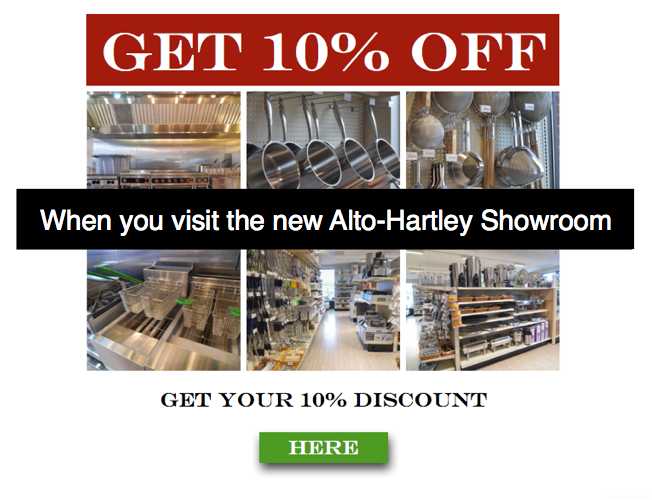 Whether you’re looking for hamburger presses, griddles, or nostalgic squeeze bottles, you’ll find all that and more in the Alto-Hartley showroom. Receive 10% off your next visit with the coupon below.